9/15/2008Share this story on Facebook! Approximately 114 Ithaca College freshmen dived into their college careers early as volunteers for the 12th annual Community Plunge. Students who were selected over the summer arrived on campus a few days early to get involved with the Ithaca community and make new friends. Led by a team of IC upperclassmen, Plunge participants volunteered at a number of locations, including the Tompkins County SPCA, Habitat for Humanity, Ithaca YMCA, and IACC Summer Day Care Camp. Kevin Fish ’11 helped lead a yardwork project at the Cornell Cooperative Extension of Tompkins County and build a playground at the Longview Retirement Center. Fish was freshman Madeline Kaiser's team leader in the two service projects. "I would recommend Community Plunge to any upcoming freshman in order to immediately get you plugged into the college and Ithaca scene," Kaiser said. "They say it takes some people a semester or so to truly feel like they belong and if they chose the right college, but after only one day of the program I knew this was exactly where I was meant to be." Community Plunge is just one of Ithaca’s Jump Start programs, which are sponsored by the Center for Student Leadership and Involvement and the Office of New Student Programs. 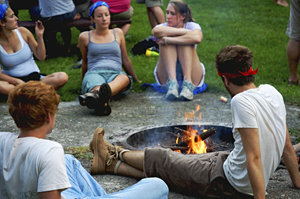 Other team-based programs for incoming students include Experience Connections by Heading Outdoors, which involves an overnight camp out along the Finger Lakes Trail and activities led bystudents, faculty, and staff; Lead-In, which focuses on building leadership skills; and the Sustainable Community Challenge, which explores the natural features, history, and social structure of the Cayuga Lake area. 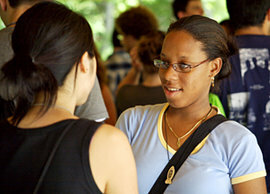 All four programs are a great way to get acquainted with Ithaca and start college off on the right foot.